The N.C. Sports Hall of Fame features more than 200 items representing 351 Tar Heel sports heroes. 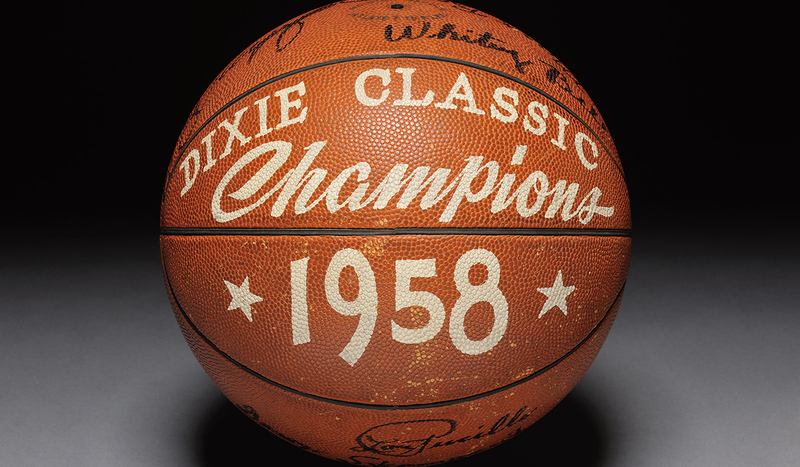 Exhibit items include champion driver Richard Petty’s stock car, Meadowlark Lemon’s Harlem Globetrotters basketball uniform, N.C. State University coach Kay Yow’s Olympic team basketball, Jim Beatty’s running shoes, Charlie “Choo Choo” Justice’s UNC-Chapel Hill football jersey and Mike Krzyzewski’s Duke University warm-up jacket. Admission is free. to honor those persons who by excellence of their activities in or connected with the world of sports have brought recognition and esteem to themselves and to the State of North Carolina. Each spring, several new members are inducted into the hall of fame. The exhibit boasts famous faces from basketball, baseball, football, golf, stock car racing, billiards, bowling, hang gliding, horse racing, shooting, swimming, tennis, soccer, and track and field, as well as contributors to sports administration, journalism, promotion and medicine. Videos in the N.C. Sports Hall of Fame take you to North Carolina’s superspeedways or to exciting moments in basketball. Interactive displays offer sports trivia quizzes that test your knowledge of sports history, and information about the inductees is available on touch screens.